Cloud computing is about making enterprise quality technology available to every company. It’s about reducing costs. It’s about increasing agility. It’s about consumer ease of use. It’s about making computing into a utility. It’s about outsourcing. It’s about dynamic capacity. Cloud computing is best understood, not by talking about SaaS, PasS or IaaS or any other *aaS (footnote 1). Ultimately cloud computing is a transformation driven by several key technological shifts bringing about new ways to achieve old goals and enabling some new solution categories. It’s a computing transformation that is only just beginning. Cloud computing is best understood as a “phase shift” or industry-wide disruption, emerging from combinations of a small number of key technological factors. To explain, I’ll use Professor W. Brian Arthur’s framework from “The Nature of Technology“. Arthur is a chaos scientist/economist noted for his seminal works “studying the impacts of positive feedback or increasing returns in economies, and how these increasing returns magnify small, random occurrences in the market place.” (Wikipedia) These principles are especially significant in technology-specific industries. Arthur’s most recent work “The Nature of Technology” looks at how technology changes over time; how it ‘evolves’. Here’s a small (paraphrased) portion of his framework. Technology: includes physical devices, processes, organizational structures. Technologies are overwhelmingly made up of other technologies as sub-components. The PC, for example, has various modular pieces of hardwire that are technologies in and of themselves, such as power supplies, hard drives, graphics cards, CPU, etc. Each of these again can be considered as having sub-components – less easily swapped, but sub-components (technologies) nonetheless that can be replaced at the design time (such as a new bus architecture for a CPU, etc). Domains: Technologies can be thought of as occurring in groups or domains – electronic, quantum, etc. This is related to the leveraging of common phenomena, but also to the nature of human specialization. Self similar types of components will be clustered. Some examples of this might be car mechanic, or computer engineer, or robotics engineer. Generally speaking technologies will be created from components that arise from skills/knowledge in a given domain. Technological change: does not occur like animal evolution – with random changes to the chromosome or by random combinations of pairs of technology characteristics. Rather, engineers or innovators will be aiming to achieve some goal and to improve the state of the art. Much of this change comes about by steady improvement in the components making up a given technology. Rebasing: Rapid change (Sometimes called disruptive change) occurs when solutions for a given problem are radically improved by replacing components of a technology with components from an entirely different domain. One example from computing is the way that the mainframe was replaced by the micro-computer. Relatively quickly the whole world of IT underwent a major change in cost, complexity and capability. Similarly, the airplane was transformed by the jet engine, the camera by digital recording. The Internet: we’re still seeing the impact of the internet rippling through our computing landscape. Adapting to computing shifts can take time, and require levels of familiarity and trust to be built, as well as understanding the broader opportunities that arise. Internet cost models, architectures, and business models are becoming understood, but are still rapidly evolving. The ubiquity of the Internet is the major driver for cloud computing. Commoditization: is part of the natural process of the technology. In this case, two major commoditization factors affect cloud. The x86/Windows monoculture: Intel and Microsoft have driven an extremely successful ecosystem of high volume, low cost chips and computers that have enabled an enormous part of our computing world today. “Monoculture produces great yields by utilizing plants’ abilities to maximize growth under less pressure from other species and more uniform plant structure” Wikipedia. Monocultures are also susceptible to shocks. So the right (or wrong) push can have a huge impact across the whole monoculture. That is to say, the ubiquity of a given architecture raises the potential impact of certain technological innovations. Virtualization: including desktop virtualization, presentation virtualization, application virtualization, storage virtualization, server virtualization and many more. These technologies provide a way to separate one “level” of an environment from another; they provide an ‘abstraction’ layer. Abstraction and virtualization is a consistent theme through the history of computing – think about virtual memory, virtual users (in which each user appears to have a whole computer), virtual disks, and many, many more. While none of today’s batch of virtualization is strictly new, the fact that they are being rapidly adopted by the (monoculture) market is very telling. Together these factors lead to a dramatic re-basing of our computing environment, at an unprecedented scale. While cloud computing is the term du jour, it is representative of a shift in all of our computing toolkits. Cloud is an ephemeral term, representative of a particular point in a larger scale rebasing of Information Technology to fully take advantage of the global Internet, a primed state of commoditization, and the broad adoption of a broad range of virtualization technologies. 1. This is seen in the overlapping and merging of these categories (SaaS, IaaS, PaaS), in the fact that much is missed (Desktop, Storage, Network, etc). Far more appropriate to move to terminology like ‘software’, ‘platform’ and ‘infrastructure’. 2. It’s not surprising that Nicholas Carr followed “Does IT Matter” with his cloud book “The Big Switch“, given that the commoditization of IT is such a significant driver for “cloud”. This is relatively dense, but the message is simple. All that we are hearing with the word ‘cloud’ in it, is merely a shorthand for a particular point in the evolution of the Internet combined with a firestorm of virtualization technologies giving us a rapid shift in what’s practical for mainstream adoption of IT. Thanks @andreleibovici and @demitasseNZ for having me on APAC Virtualization Roundtable. Congratulations @andragy on this very cool, very fun Ada Lovelace Presi for Ada Lovelace day. Featured on http://findingada.com. Here’s to more women in IT and tech. What does a pattern mean to you? The modern software idea of Design Patterns comes from work done building out a language of patterns for architects. This idea has been a profound influencer of software design approaches and was pioneered by the ‘Gang of Four’. Pattern thinking has also been applied to architecture, and to broader notions of IT design and management. For example “Architecture and Patterns for IT Service Management , Resource Planning, and Governance: Making Shoes for the Cobbler’s Children”. This book provides actionable patterns for treating IT like a business (and is highly recommended). I would like to propose an important pattern that sits between enterprise architecture and application architecture for virtual desktops and virtual applications. MOTIVATION: In today’s era of rapid change and consumerization all users have growing expectations from their enterprise computing systems. This raised expectation is generally portrayed as affecting only end users, but the reality is that these users include the business owner (aka The guy who pays the IT bills). This raised business expectation is much like when the microcomputer revolution hit mainframe/mini IT shops (and it was equally tempting for business to ‘go around’ IT – at the time by purchasing PCs, now by moving to SaaS). We have an environment with ever higher expectations of IT. At the same time there are ever more desktop and hand-held device types. We are amidst a transition from a period of relative end-point homogeneity (Windows, Windows and Windows) to a period with multiple desktop environments (increases in Macs and Linux) and where most internet access will occur from a heterogeneous range of hand held mobile devices. This is a new game, a new paradigm, and one that is not going away any time soon. (I’ve talked about this elsewhere). IT is facing dual challenges of increased agility expectations and increased device heterogeneity. This is a problem because traditional end-point management leads to ‘installation inertia’. That is, each carefully crafted desktop image or application install becomes yet another point that must be rebuilt with every application or architectural change. Like a poorly lubricated engine, the whole system is impaired and in many cases can all but grind to a halt. This friction costs you, and your company, money every day. THE PATTERN: So, to come back to the notion of patterns … In traditional software pattern terminology, there is a pattern called a mediator. This pattern acts as a way to manage communication between large numbers of frequently changing objects. The idea is that by having a module, or program that acts as a connector between these different components – it avoids propagating changes from one object through all others it touches by isolating the changes in the meditation object. This is exactly what we achieve with desktop and application virtualization. Changes can occur in any application without affecting end user devices. At the same time end user devices can be completely changed without affecting the applications. Hence, the Desktop and Application Virtualization Mediator Pattern is the right way to manage the device/application nexus in your IT infrastructure. It avoids the installed application inertia trap. It reduces friction and increases your Enterprise Architecture agility. There seems to be a great deal of ‘design pattern’ books on the market, I thought it would be interesting to look at how they could be used to motivate the use of a desktop/application virtualization strategy. This is dense, but well worth the read. This is also fascinating material to consider in greater depth. It provides a perspective well beyond the technological utopian view that pervades so very much of our industry. Great interview with Dana Boyd on her work at Microsoft Research – nice primer on realities of the web/social net for the “digital native”, and a couple of pointers on how location changes a lot of social games. If you prefer text, check out her articles at <a href="http://www.danah.org/. We are women technologists. We use technology to connect our communities. We create technology because it is who we are ??? intelligent, creative and driven. We lead with compassion and a belief in inclusion. We develop competitive products and find solutions to problems that impact our lives, our nation, our world. Together, through the Anita Borg Institute for Women and Technology (ABI), we are inventing a better future. Working with men that believe in our mission, we are changing the world for women and technology. The Anita Borg Institute has several initiatives to promote and celebrate women in technology. The 2010 Women of Vision awards celebrate women who have made significant achievements in 3 areas. This excerpt of a post from Katy Dickinson at SanJose.MetBlogs.com shows why this is important! “I have referred dozens of young women to the 2008 WOV talk by Helen Greiner. Any girl geek who feels too alone in her love of technology will be encouraged by the amazing founder of iRobot saying that when she was young ?? ?not one person told me I should be an Engineer??? and ?? ?we need diversity of perspectives ??? more women?? ?s life experiences influencing our directions and designs???. Thanks @cesar_albarr #ARIN6902 for finding this great Liquid Theory TV http://bit.ly/9wuJ09 on Deleuze & Control with the recent thinking on digital culture, web 2.0 and internet governance. Brian Arthur’s redomaining as a way to think about "cloud"? Same task – new toolkit. Review to come. 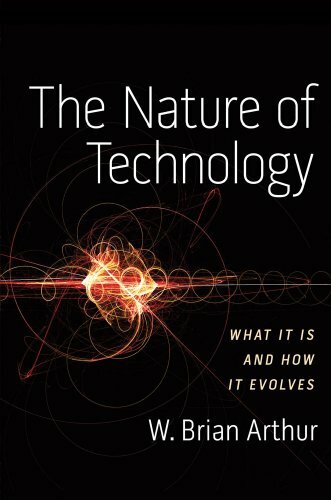 If you seek the underlying patterns as I do, this is a fascinating meditation, theory, or indeed philosophy of technology. Stay tuned for an in depth review.